Playtech has gone international with this football game slot, full of features and well known players. Whilst the theme uses Brasil's colours, all our top trump players are in their line-up, most notably the best of the best of yesteryears players. 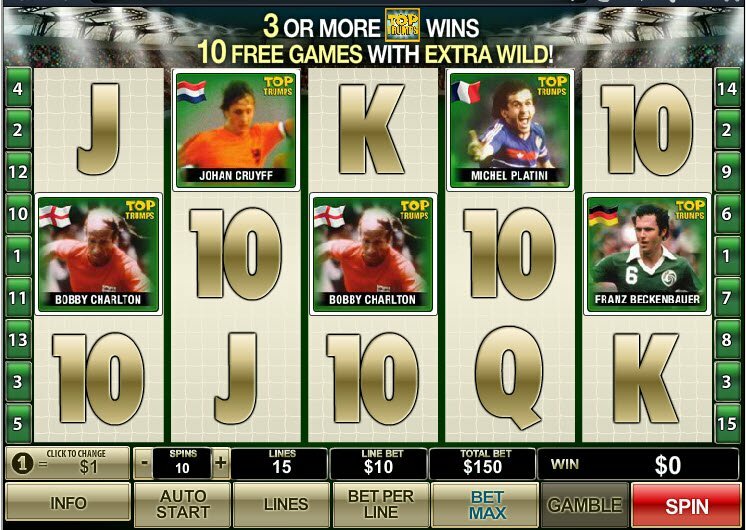 With 29 featured football players to get your chops round, Top Trumps Football Legends Slot is Playtech's finest hour, for the true football connoisseur. Three scatter symbols, comprising of the game logo, shattering into pieces upon spinning, before magically being glued back together by an invisible hand, is the trigger for the free games round for 10 free spins, all at a multiplier. Along with the cheering and packed out stadium, you'll feel like you're taking part in the match of your dreams with the Top Trumps Football Legends 15-reel slot from Playtech. Each football star is shown with his national flag and a famous photo of him, so that it takes no guessing to work out who is helping you win your wagers. 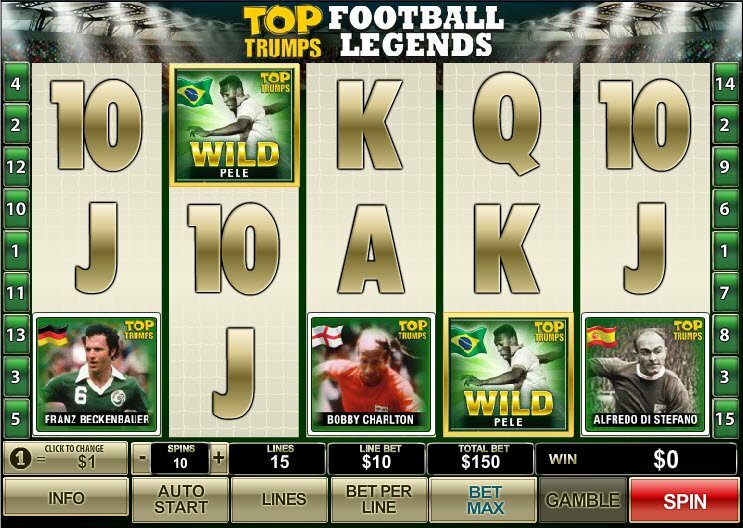 Pele is our Top Trumps Football Legends slot Wild symbol, perhaps homage to his fiery Brasilian nature? Reel in 5 of him for the Top Trumps Football Legends slot jackpot of £10,000. 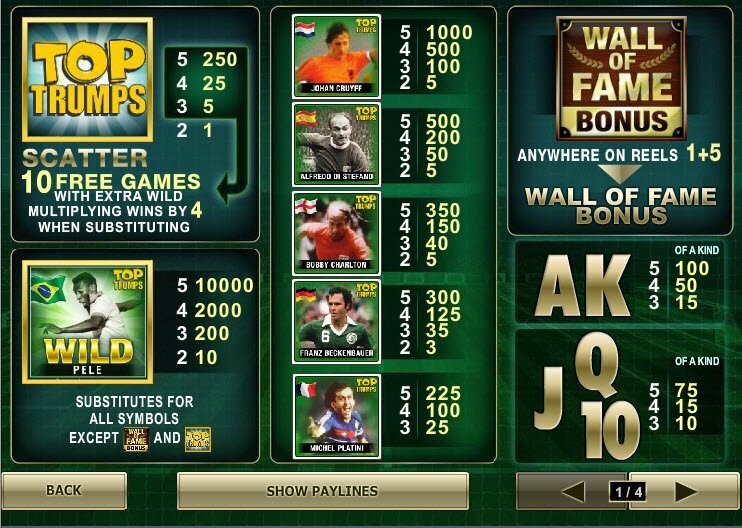 The real gem of a feature here is the Top Trumps Football Legends slot bonus round. Epitomised by a polished sports plaque, varnished and well taken care of that will send you into the Wall of Fame bonus round if you see it anywhere on your reels. All our legends will pop up, each representing a different cash prize, you can shuffle the players and might even get rewarded with an extra pick.